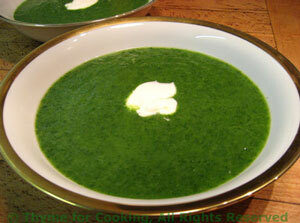 Emerald Soup, with spinach and leeks, an elegant first course. I was given the recipe for this soup by the chef of Tidy Dols in London. It's bright green color and fresh taste have been a favorite for years. This makes enough to serve four. Roughly chop onion, celery and thinly slice leeks. (To clean leeks see techniques). Melt butter in medium saucepan over medium heat. Add onions, celery and leeks and sauté until softened. Roughly chop potato (peeling optional) and add to pan along with 3 cups chicken stock. Bring to a boil, reduce heat, cover and simmer until potatoes are done, about 15 minutes. Pick through spinach, removing any bad leaves and thick stems. Add to soup when potatoes are done. You will probably have what seems like a huge amount of spinach but it will all fit - just add handfuls of leaves, stir into soup; when they are wilted, add more. Add more chicken stock if desired.